We welcome our Summer Legal Research Assistants at the Sir James Dunn Law Library. Each May we offer a series of workshops to help RAs refresher their legal research skills. These sessions are for students with some prior legal research training. No registration is required and we will bring the muffins. If you have any questions please contact us at lawref@dal.ca or 902-494-8856. Join us for a series of mini-workshops on research paper writing. No pre-registration required. The sessions will be held in the Law Library Reserve Collection. 9:00 am Finding Stuff: This is a short workshop of finding books and articles using our library’s collections and online subscriptions. Explore the many research tools we have and find the best tools for your research. 9:30 am Now what? This is a short workshop on choosing and narrowing your research topic to develop a manageable research question. We will look at how to create a research plan and paper outline. 10:30 am Answer Man Can: This is a short drop-in session to ask questions and get tips on using Westlaw and Lexis Quicklaw more effectively for your research. Discover which tool is best for your research. 11:00 am Anywhere! We don’t have it? In this short workshop discover how to search and request materials from any library in the world for free through the Interlibrary loan service. The TriCouncil funding agencies (NSERC, SSHRC, CIHR) have recently released their guidelines for research data management and planning. The Faculty Council of the Faculty of Agriculture has invited you to give a 20 minutes presentation to the Council to introduce them to research data management & research data planning, and the related resources for them to meet these guidelines. Presentation – Measuring Impact: Quantitative Methods by Melissa Rothfus, MLIS, PhD. When: Wednesday, July 8th at 10 a.m. Seating is limited to 24. In many parts of the world, the past two decades have witnessed the development of a direct and explicit link between research funding and research impact. How that impact might be defined and measured is open to interpretation by funding organizations and varies according to context. In general, impact refers to the demonstration that one’s research has in some way made a contribution to his or her field. A variety of factors and issues are involved in demonstrating research impact and both quantitative and qualitative methods have been developed or are developing. The goal of each of these is to create objective means by which the importance and value of research can be judged. While North American institutions have largely been less receptive to an impact based funding model, international collaboration coupled with a competitive funding environment suggests that North American researchers would be wise nonetheless to consider how their own research impact can be tracked and demonstrated. In their role as supporters and facilitators of research, as well as researchers themselves, librarians are well positioned to provide valuable assistance in demonstrating research impact. This presentation will offer a summary of some of the most critical tools available. Video conferencing will be available for those in Truro interested in the presentation. * The Tupper link is the windowed hallway between the Kellogg and Tim Horton’s. Take the staircase nearest the bathroom and make a left at the top of the stairs (so you don’t end up in the student lounge) and go through 2 sets of doors and the room is on the right. 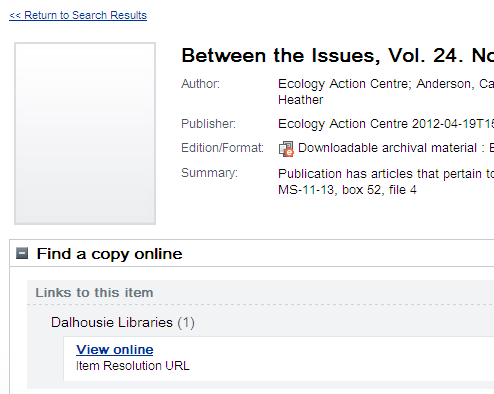 Do you use Dalhousie Libraries’ Subject Guides for research help and ideas? On July 1st, our Subject Guides will be going through a system and interface upgrade. During this time, there may be minor interruptions and downtime. The helpful content on the guides will remain the same, but the guides themselves will have a different look. The pages for the Subject Guides will now be accessible via side navigation rather than top navigation. 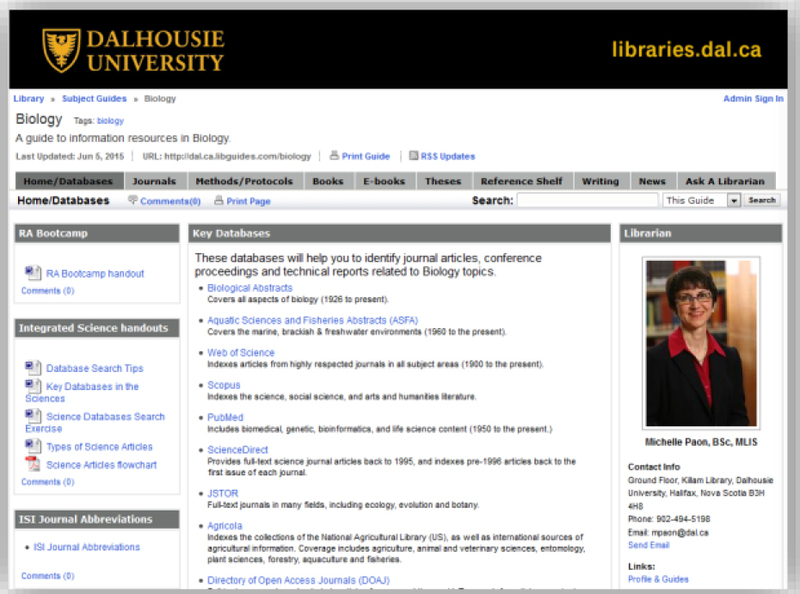 If you visit our Subject Guides homepage at www.dal.ca.libguides.com after July 1st (or by clicking “Subject Guides” from the Libraries homepage), you’ll be able to browse through a list of all of our guides, as well as a list of many of our online databases and resources. If you are a frequent user of our Subject Guides, we hope you enjoy the new interface. If you’ve never used the guides before, we encourage you to check them out! 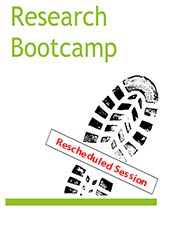 We are pleased to announce that the Research Bootcamp session on Statistics and Data has been rescheduled, and will now be held on Monday June 29, from 9:00-12:00 in the McCain Building, Room 2019. Overcoming the Challenges of Searching for Data and Statistics: You Can Do It! This gentle introduction to overcoming obstacles commonly faced when searching for data and statistics will enable you to both identify potential pitfalls of your research question and better navigate the world of data research. How to Search for Data and Statistics: Look in the Right Places! How do you even start a search for data and statistics? We will explore a suggested workflow, and go over some general tips and tricks for searching for the data and statistics you need. You will have the opportunity to practice what you’ve learned with fun exercises using examples from the health sciences, engineering, and any other discipline we might be interested in exploring. Searching For Data And Statistics Using Dal Resources: We Want To Help You! 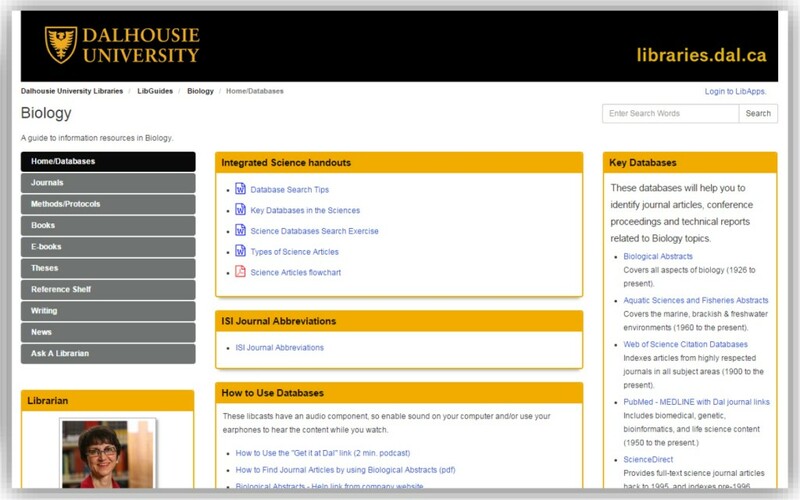 Did you know that the Dalhousie community has access to datasets not easily accessible to the regular public? What is the continuum of access and how might it have an impact on your research?Learn how to use Dalhousie’s resources to become even more effective at data research, and practice very basic data analysis using SDA. 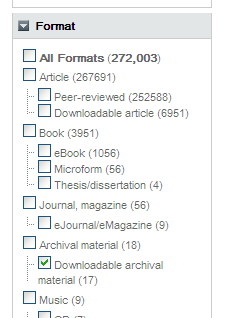 Do you have RAs responsible for doing literature searches, citation management, or other work in support of research? Do you have TAs responsible for assisting students with finding information for their research papers? The new Research Bootcamp offered by the Dalhousie Libraries may be just the thing to firm up their research skills. The objective of the Bootcamp is to develop and/or refresh the literature searching and information management abilities of research assistants, teaching assistants, and graduate students. The Bootcamp starts off with Foundation Parts 1 and 2, which are applicable to all participants. From there, your RAs and TAs can customize their suite of workshops by choosing from a selection of discipline-specific literature searching workshops and information management skills workshops to best address their needs and the work with which they will be involved. Register your students for the Foundation and U-Pick sessions. Registration will remain open until May 1, 2015. 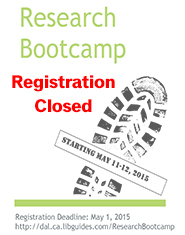 Visit the Research Bootcamp site [http://dal.ca.libguides.com/ResearchBootcamp] for all the detail, and select the “Register” tab to sign up. Helen Creighton was a Canadian folklorist who collected songs, stories, and myths, mostly from her home province of Nova Scotia. 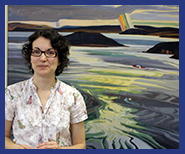 And Creighton Barrett (name is purely a coincidence) is the Digital Archivist for the Dalhousie University Archives who has been researching Helen Creighton’s work since he was a music student at Acadia University in 2004. This year, Creighton received three grants to support his current research project, entitled: Investigation of Sponsorship, Copyright, and Intellectual Property Issues Surrounding Helen Creighton’s Folk Song Recordings. 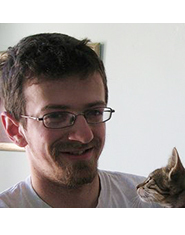 In early 2014, he received a $1,000 Collaborative Research and Innovation Grant from the Council of Atlantic University Libraries (CAUL) and a $2,000 travel grant from the Rockefeller Archive Center Grant-in-Aid program. Creighton spent the travel grant on a trip to Sleepy Hollow, New York, to visit the Rockefeller Archive Center. In October 2014, he was awarded a $3,500 Social Sciences and Humanities Research Council (SSHRC) Research Development Fund grant through Dalhousie University. Most of this grant will be combined with the CAUL grant to hire a research assistant. Creighton’s project is attempting to answer several research questions about the copyright and intellectual property status of folk song recordings made by Helen Creighton, but it is rooted in his broader interests in the archiving of folklore and cultural heritage. “My research interests involve the documentation and preservation of intangible cultural heritage. Academic researchers are typically leading these efforts, which often lead to the creation of vast multimedia archives with complex ethical, legal, financial, and technological obligations for the academic libraries and archives that end up taking custodianship of these materials. Intangible cultural heritage has also emerged as a key component of education, tourism, and cultural initiatives, yet many of the most pertinent resources are distributed across multiple institutions, poorly described, and mired in questions about copyright, intellectual property, evolving organizational priorities, financial challenges, etc.,” says Creighton. Digital archivist and Helen Creighton researcher, Creighton Barrett. “I want to pull together all the information about Helen Creighton’s collection and find a way for the archives that hold her recordings to work together,” says Creighton. “There are copies of the same songs held in various archives, and it’s difficult to tell where the original recording is located,” says Creighton. Pieces of Helen Creighton’s collection can be found in the Nova Scotia Archives, Mount Allison University, Université Laval, the Canadian Museum of History, and in the Library of Congress in the United States. On March 18, 2015, Creighton will give a free public lecture to the Royal Nova Scotia Historical Society, entitled: American sponsorship of Helen Creighton’s folk song collecting in Nova Scotia during the Second World War. More information about this public lecture will be available in the coming months.